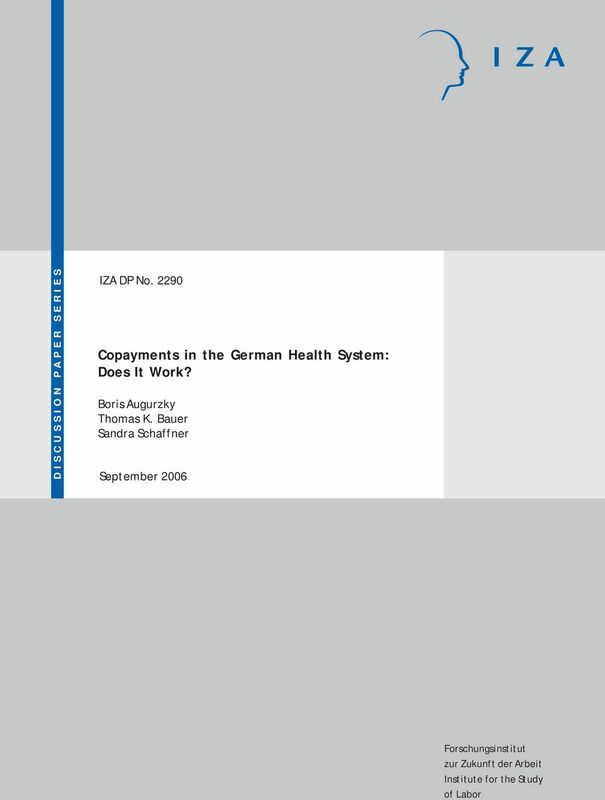 Download "Copayments in the German Health System: Does It Work?" 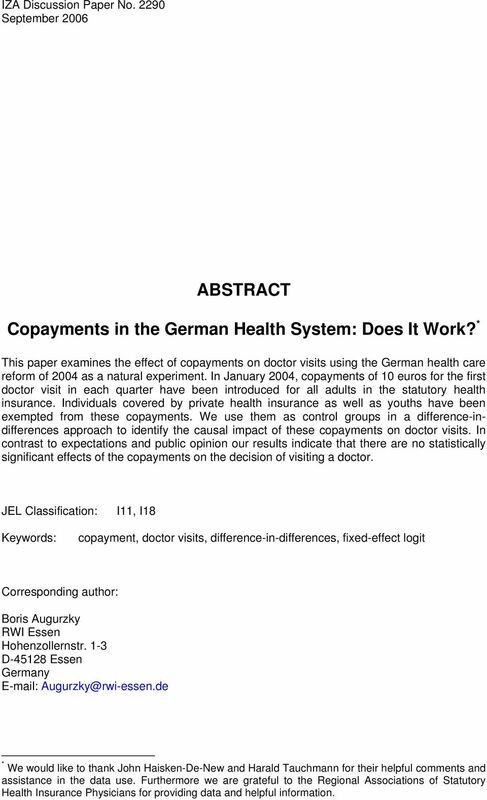 2 Copayments in the German Health System: Does It Work? 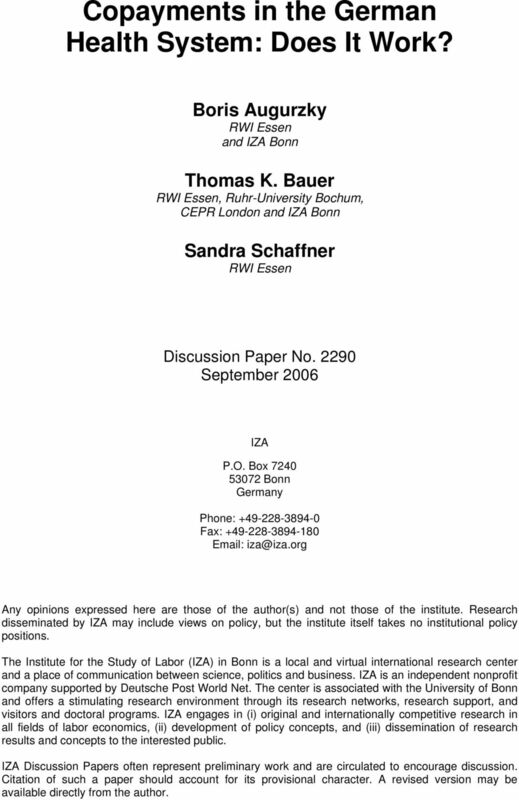 Boris Augurzky RWI Essen and IZA Bonn Thomas K. Bauer RWI Essen, Ruhr-University Bochum, CEPR London and IZA Bonn Sandra Schaffner RWI Essen Discussion Paper No September 2006 IZA P.O. 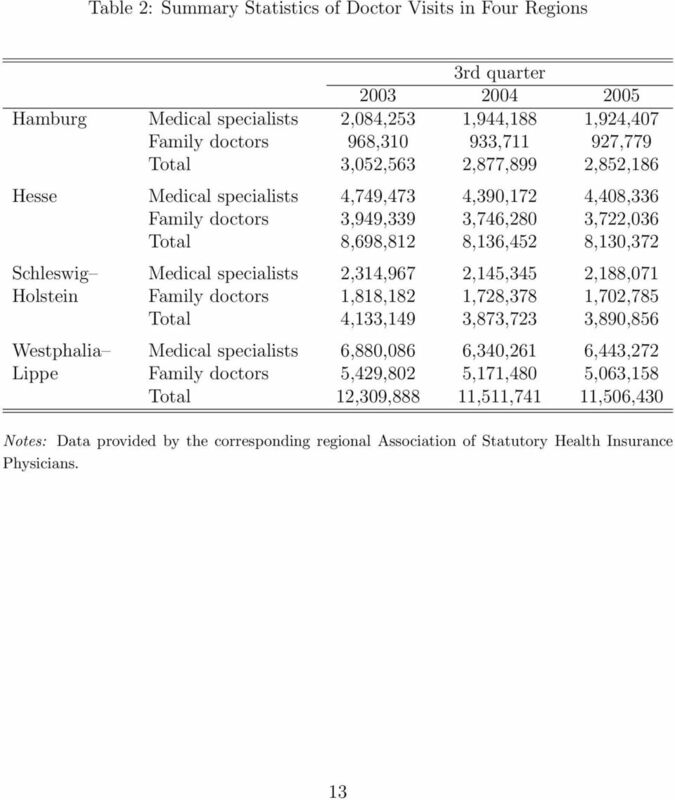 Box Bonn Germany Phone: Fax: Any opinions expressed here are those of the author(s) and not those of the institute. Research disseminated by IZA may include views on policy, but the institute itself takes no institutional policy positions. The Institute for the Study of Labor (IZA) in Bonn is a local and virtual international research center and a place of communication between science, politics and business. IZA is an independent nonprofit company supported by Deutsche Post World Net. The center is associated with the University of Bonn and offers a stimulating research environment through its research networks, research support, and visitors and doctoral programs. 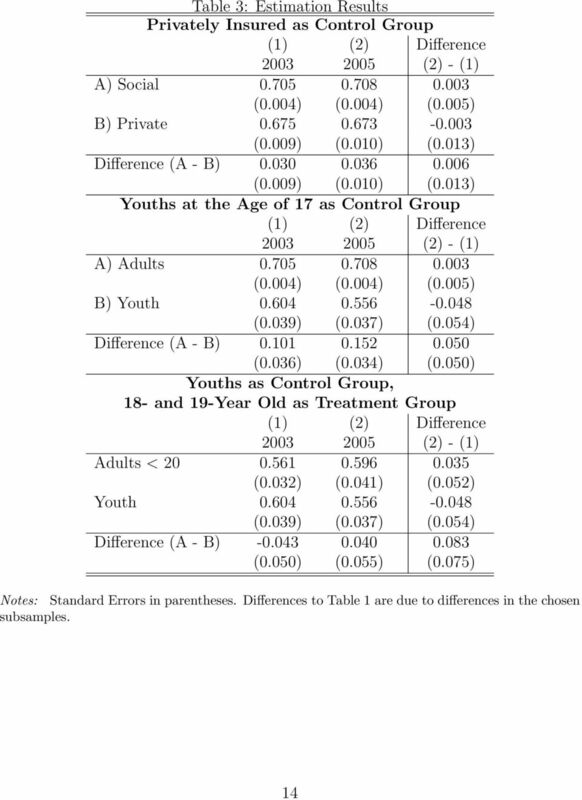 IZA engages in (i) original and internationally competitive research in all fields of labor economics, (ii) development of policy concepts, and (iii) dissemination of research results and concepts to the interested public. 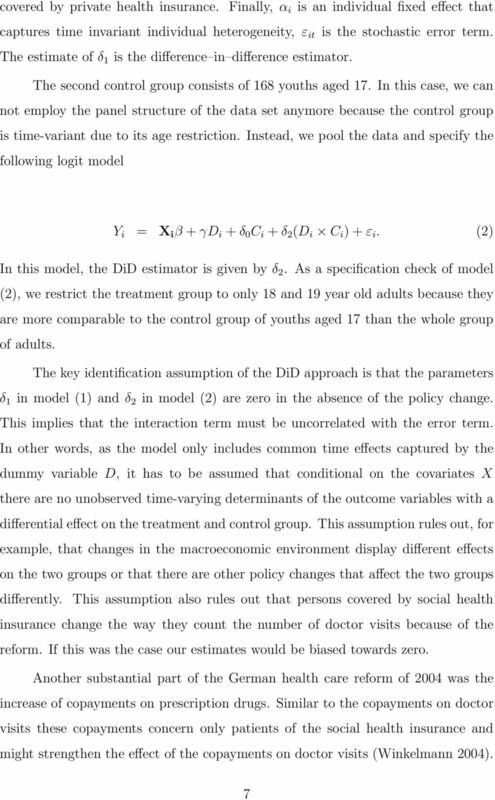 IZA Discussion Papers often represent preliminary work and are circulated to encourage discussion. 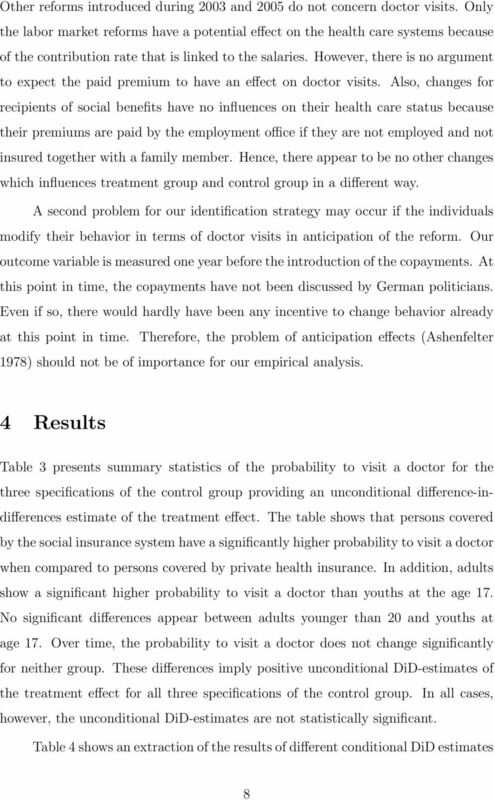 Citation of such a paper should account for its provisional character. A revised version may be available directly from the author. 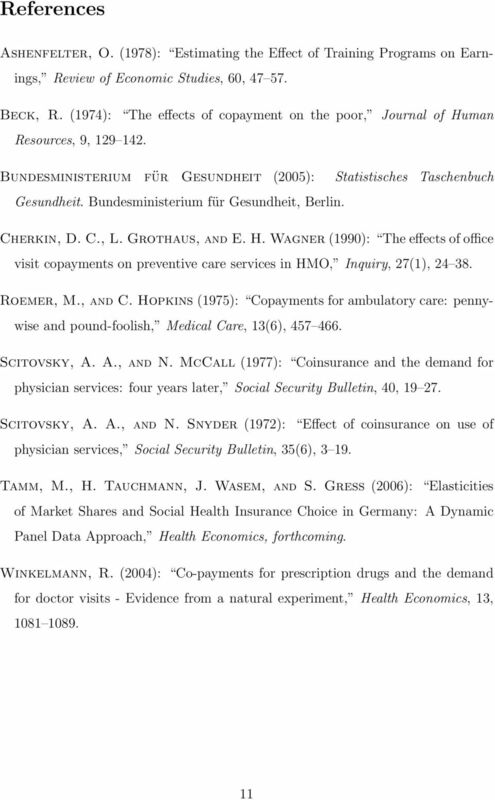 3 IZA Discussion Paper No September 2006 ABSTRACT Copayments in the German Health System: Does It Work? 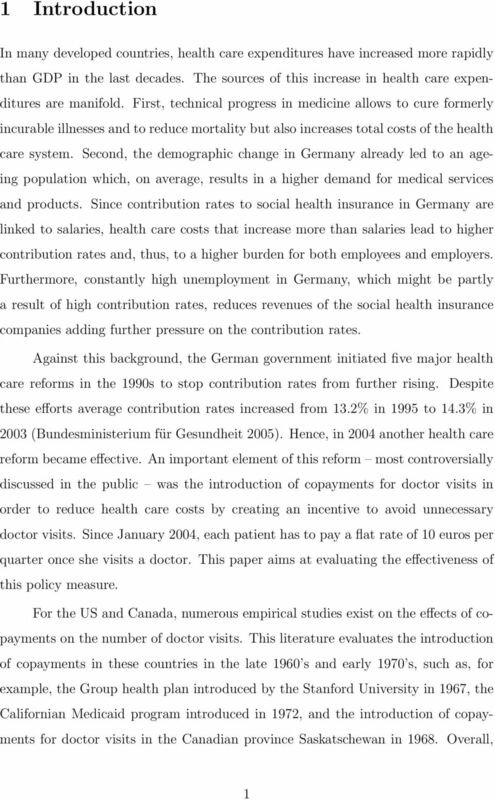 * This paper examines the effect of copayments on doctor visits using the German health care reform of 2004 as a natural experiment. 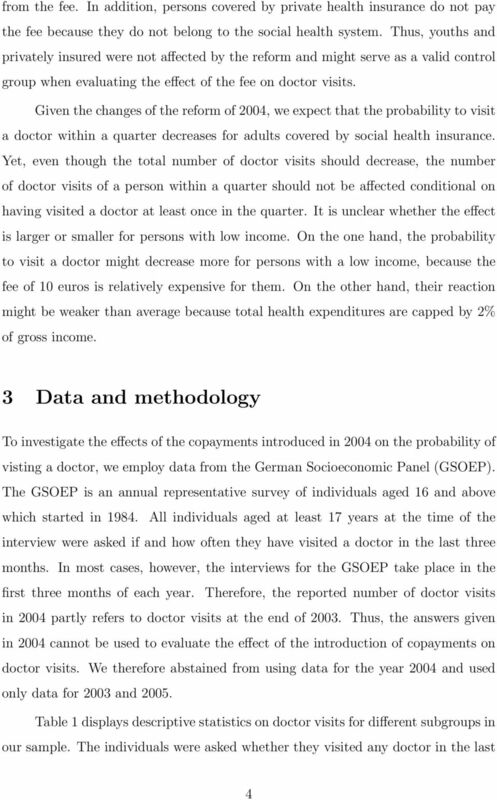 In January 2004, copayments of 10 euros for the first doctor visit in each quarter have been introduced for all adults in the statutory health insurance. 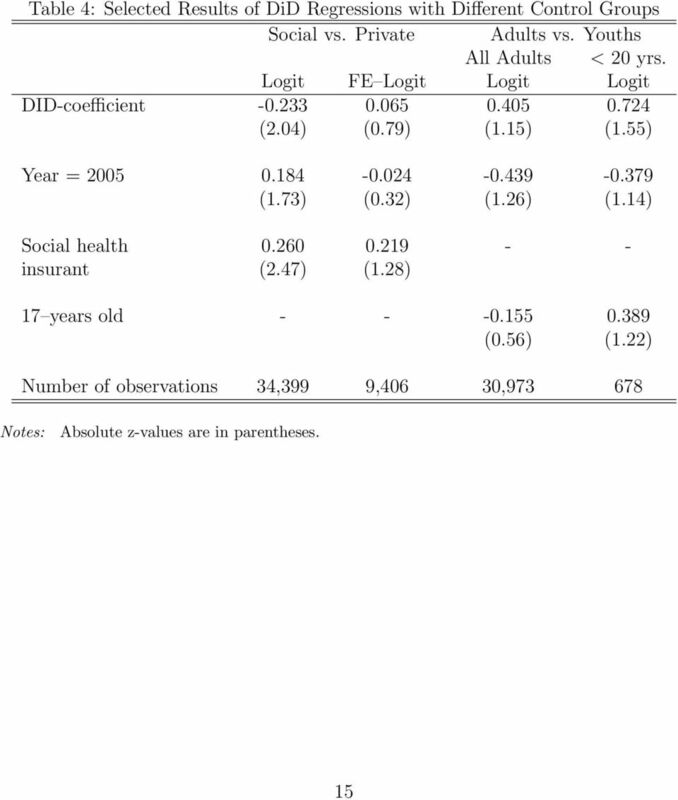 Individuals covered by private health insurance as well as youths have been exempted from these copayments. 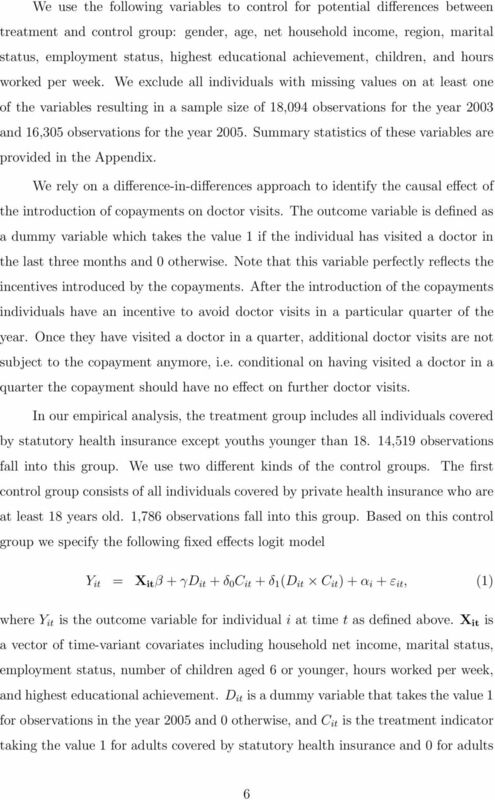 We use them as control groups in a difference-indifferences approach to identify the causal impact of these copayments on doctor visits. 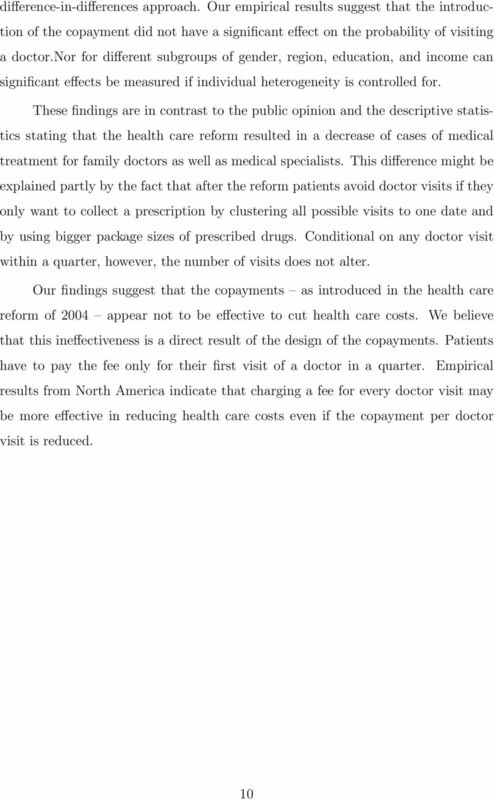 In contrast to expectations and public opinion our results indicate that there are no statistically significant effects of the copayments on the decision of visiting a doctor. 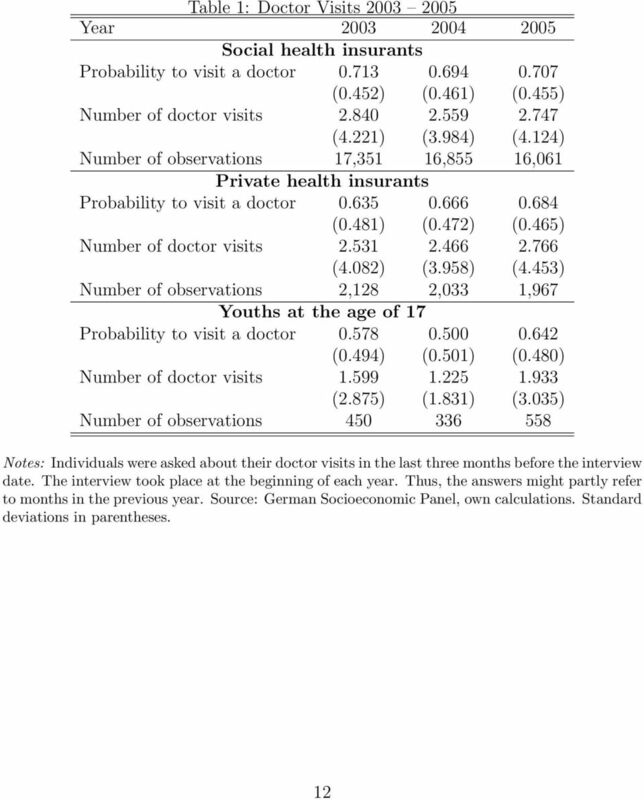 JEL Classification: I11, I18 Keywords: copayment, doctor visits, difference-in-differences, fixed-effect logit Corresponding author: Boris Augurzky RWI Essen Hohenzollernstr. 1-3 D Essen Germany * We would like to thank John Haisken-De-New and Harald Tauchmann for their helpful comments and assistance in the data use. 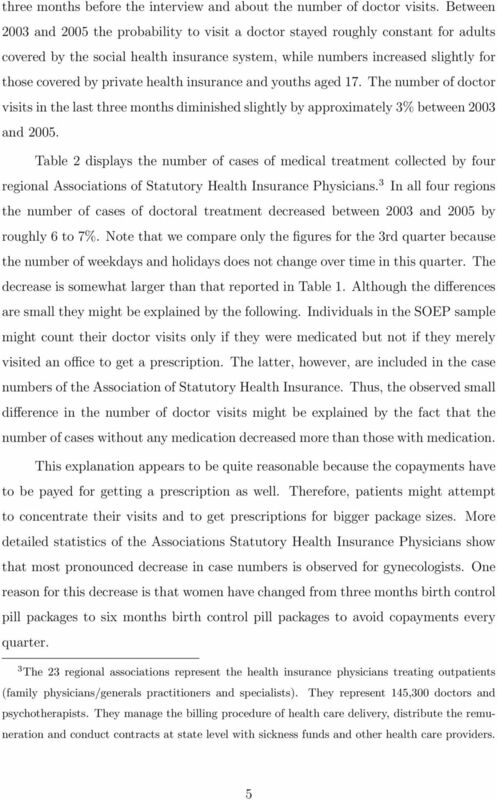 Furthermore we are grateful to the Regional Associations of Statutory Health Insurance Physicians for providing data and helpful information. 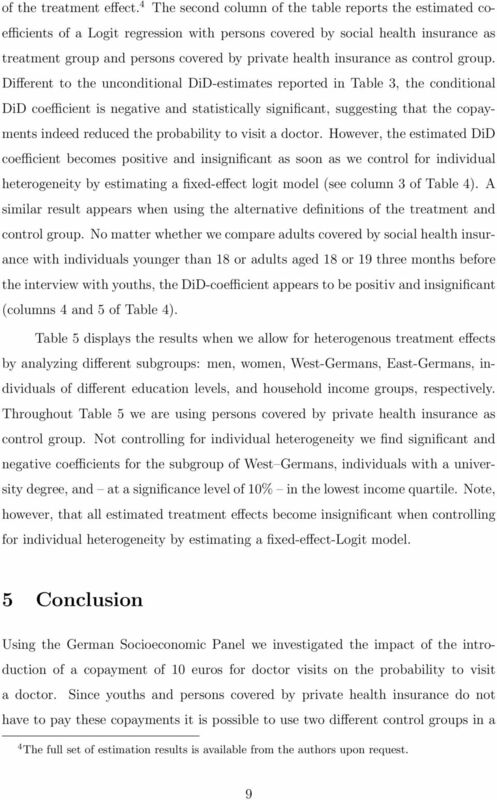 Tax incentives, bequest motives, and the demand for life insurance: Evidence from two natural experiments in Germany. Nicolas Sauter. Agency in Health-Care: Are Medical Care-Givers Perfect Agents? 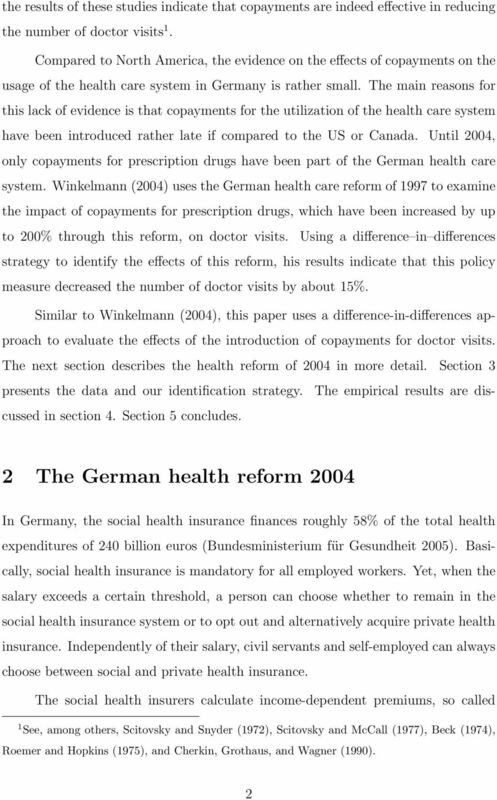 Question: Why should we as Americans consider features of the German system in crafting our own health care reform? 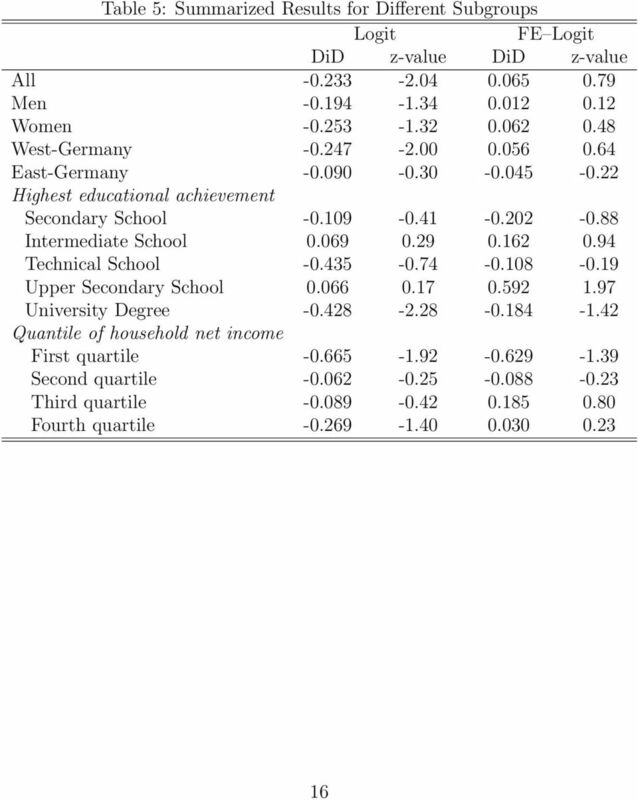 Leadership at School: Does the Gender of Siblings Matter? 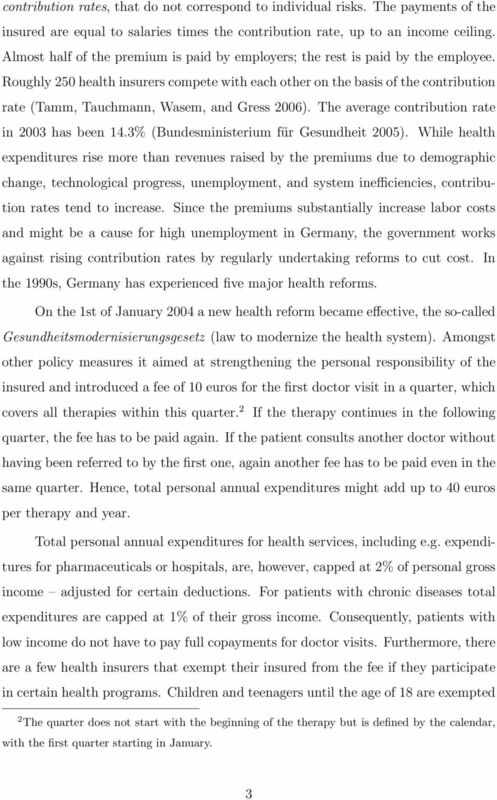 Are German Tax-Revenue Forecasts Flawed?